Like any limelight-loving celebrity, Bigfoot is back to say, "Look at me!" A furry hominid reportedly sighted on the mountainous west coast of North America and in the Himalayas (where he goes by Yeti), Bigfoot’s existence has been largely debunked. 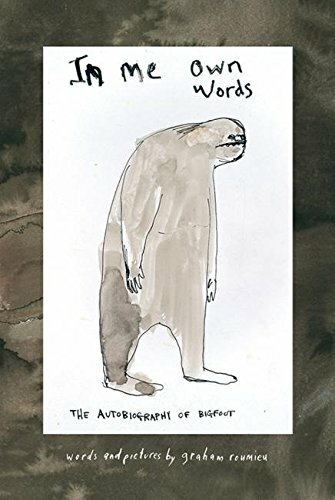 That hasn’t stopped him from recently releasing his third book, Bigfoot: I Not Dead, which follows Me Write Book: It Bigfoot Memoir (2005) and In Me Own Words: The Autobiography of Bigfoot (2003). The trilogy is actually the work of Toronto-based illustrator Graham Roumieu, whose version of the fabled creature is alternately vulnerable and vicious. For the most part, Roumieu’s Bigfoot just wants to make another (clumsily worded) attempt to redeem his image in the media and clarify who he is on the inside. And really, isn’t that what every misrepresented celebrity wants? How Bigfoot plans to improve himself: "Think outside box. Lose ten pound. Learn speak the French. Ballroom dance. Demonstrate superior knowledge of fine wine at dinner party in charming non-pretentious manner. Be Oscar Wilde of woods. It so hard. Brain size of apricot." In this latest instalment, Bigfoot imparts environmental tips, reveals a secret, salacious fact (his addiction to eating garbage) and shares a "Self Improve" list: "Learn speak the French. Ballroom dance. Demonstrate superior knowledge of fine wine at dinner party in charming non-pretentious manner. Be Oscar Wilde of woods. It so hard. Brain size of apricot." Bigfoot’s rage manages to be more funny than frightening: "BIGFOOT NOT GRANT WISHES LIKE LEPRECHAUN OR GENIE. Only exception be that if you want wish for kick in you face then go ahead and rub me belly." Bigfoot’s amusing yet anti-social musings make you wonder just how much of the books are actually part of Roumieu’s interior monologues. "I suppose a lot of it is taken from my own life and my friends’ stories as well," Roumieu says during a recent phone interview, taking a break from working on an illustration for the New York Times. "But it’s more the essence of the stories. Because the stories revolve around misunderstanding, it’s just about people’s confusion over the way they see the world. "In a way, the books are about isolation and living on the fringes and using Bigfoot is just very literal. Bigfoot could be a kid in the suburbs, could be me growing up in a small town, could be an office worker sitting in a cubicle, could be an A-list celebrity who feels isolated by the fame as well." While everyone can relate to feelings of loneliness, big stars and monsters like Bigfoot share the distinct frustration of being defined by other people. "Celebrities are the new monsters," Roumieu says. "They’re constructed out of their own press agents and their handlers." I tell him that Jennifer Aniston would probably object to being called a monster. "We’ll just go with ‘mythical beast,’ then," Roumieu says. "Their true selves are probably not portrayed very well, not only in tabloids but in their own press releases. To the point, I’m sure, where they don’t even understand themselves and what their own true nature is after a while." In the new book, the giant monster’s mood swings from feeling unloved (on one occasion, the head of Bigfoot’s date pops off to reveal squirrels holding a little sign that reads "Nobody loves you") to a regal sense of self-importance ("Biggest perk of be king is get drink first at watering hole. It good because Bigfoot really hate commoner backwash.") In other words, he has self-esteem issues like the rest of us. "I don’t have incredible self-confidence," Roumieu admits with a laugh. "I am a bit of an introvert in the same way Bigfoot is. And similar to Bigfoot, it’s part of my job, whether I’m writing these books or doing illustration work, to put myself out there, and it’s a bit of an uncomfortable thing to do at first." 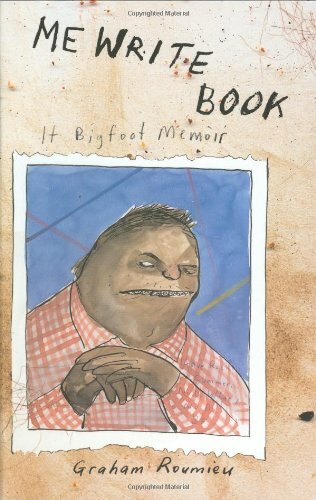 Roumieu’s Bigfoot memoirs have been garnering attention for their watercolour images and sharp wit. So what kind of fame can an author/illustrator expect? "Every once in a while it comes up in conversation that people have read my books and it’s pretty exciting, even though I try to direct the conversation away from the topic as quickly as possible, which drives my publicist insane." Which leads to the rumour that Bigfoot is to become a screen star. Is Bigfoot going Hollywood: true or false? "Partially true," Roumieu admits. "I’m not exactly allowed to say what’s going on," he demurs, in a true nod to tenuous Hollywood deals. Whatever happens, it’s clear that Roumieu’s Bigfoot has the A-list attitude — if not the red-carpet manners — to hold his own in Hollywood. 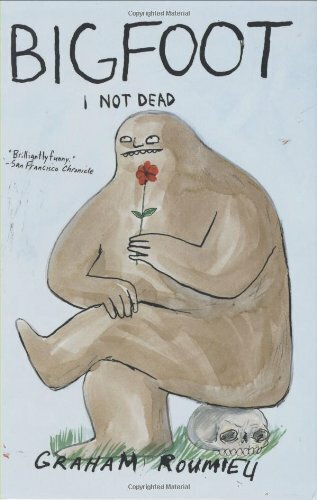 Bigfoot: I Not Dead is published by Penguin and is in stores now.